Starlites GIG (Women League) landed 23-year old American (has also Dominican passport) center Giocelis Reynoso (190-95, college: Central Connecticut State, agency: Gamble Sports Management). She is the second foreign player in the roster as Spanish Patricia Arguello signed here earlier. Reynoso played in the summer at San Salvador in Salvadorean Liga Mayor. In 5 games she averaged impressive 20.6ppg, 21.0rpg, 3.2apg, 1.6spg and 2.6bpg. 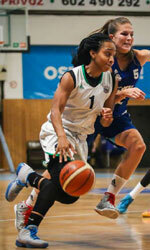 The last season Reynoso played at Tallina in league where in 10 games she had 11.3ppg, 10.2rpg, 1.1spg and 1.7bpg. Reynoso won Estonian Meistriliiga championship title. She received Latinbasket.com All-Centrobasket Honorable Mention award in 2018. Reynoso represented Dominican Republic at the Centrobasket in Manati (Puerto Rico) last year. Her team got to the Semifinals and her stats at that event were 4 games: 10.8ppg, Reb-2 (10.3rpg), 1.5spg, Blocks-5 (1.5bpg), FGP-3 (64.3%), FT: 63.6%. 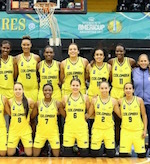 Reynoso graduated from Central Connecticut State in 2017 and it is her second season in pro basketball. 13 Giocelis Reynoso 188-C Tallina U. 13 Giocelis Reynoso 190-C-95 Tallina U.
Colombia have won Bolivarian Games 2017 routing Dominican Republic 58-45 in the Final game. Colombia grabbed a slow 12-10 lead and then added a 15-12 rally in the second frame. Moreover, Colombia managed to win the third period 16-10 and closed the game with a final 15-13 run. Yaneth Arias stepped up with 18 points, while Narlyn Mosquera netted 12. Esmery Martinez answered with 12 points and Genesis Evangelista had 11.